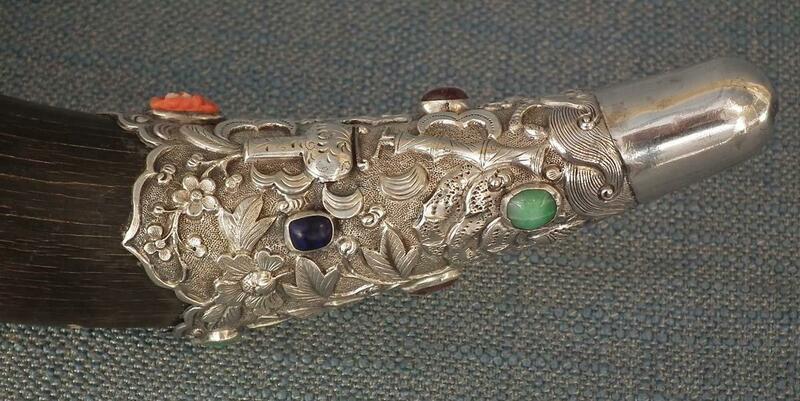 A remarkable museum quality antique 18th-19th century Chinese Qing Dynasty silver mounted jeweled drinking horn (Gong). 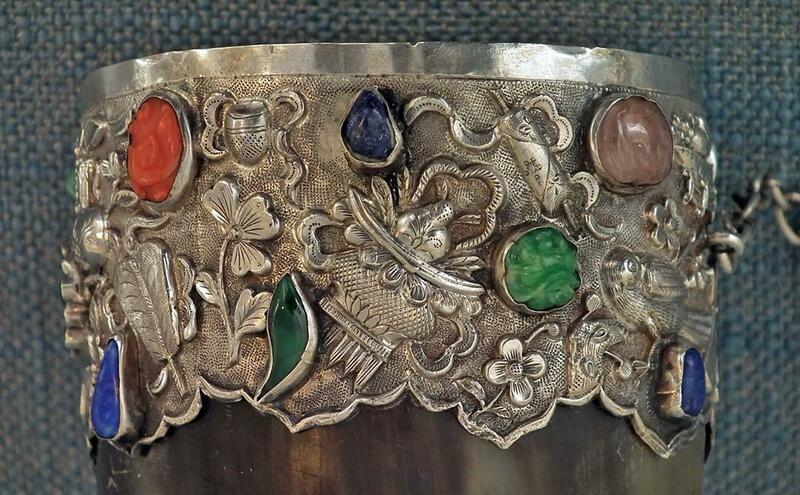 The slightly curved polished horn body mounted with three solid silver mounts each finely embossed, chiseled, and engraved with many precious Buddhist and Taoist emblems and auspicious motifs as vases, incense burners, swords, fans, scrolls, fishes, birds, wealth coins, Wheel of Dharma, and many other symbols, and are inset with settings of various 35 sizes and shapes of Gemstones including Jades, Corals, pink Tourmalines Lapis lazuli, and other Gemstones some of them carved with bats and flowers. The top and the middle mounting are fitted with a carrying chain and with a suspension hook. 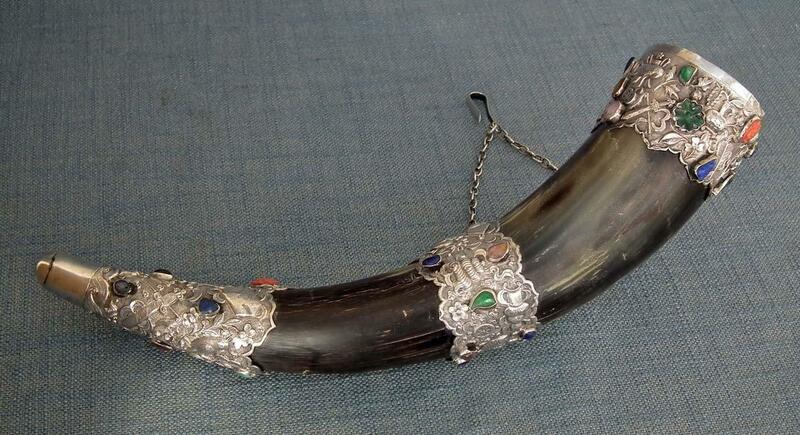 We had been searching for another example of this rare Chinese silver mounted and jeweled drinking horn in all possible sources including world museums’ catalogues, books on the Chinese art and antiques, internet sources, but we did not find a second example of this particular horn in any of these references. 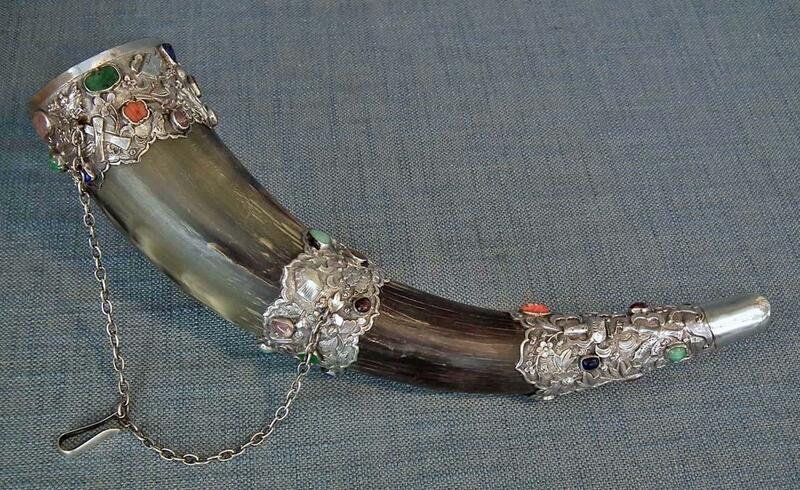 So, it is possible that it is the only existing example of this horn in the entire world. 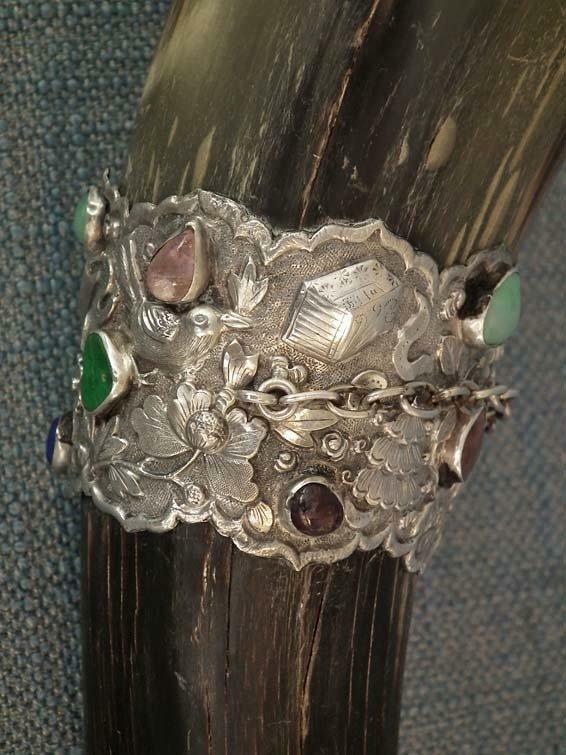 This exclusive drinking horn is mounted in a superbly chiseled and jeweled silver and is truly the highest quality Chinese art work. 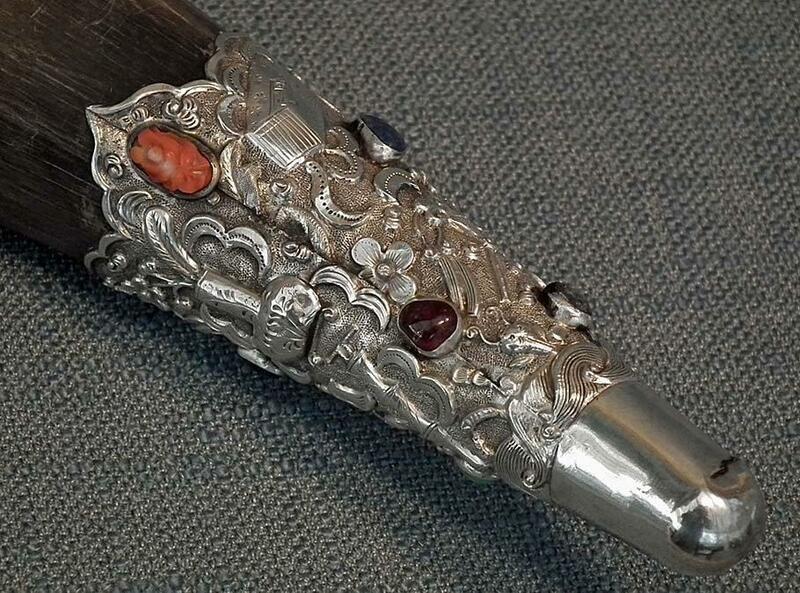 Possibly it had been custom made only in one example by a skilful Qing dynasty court silversmith for personal use of a high rank Chinese aristocrat and is meant to be carried as a drinking vessel during traveling, hunting, or combat since porcelain and pottery as drinking vessel was easy to break in the field. 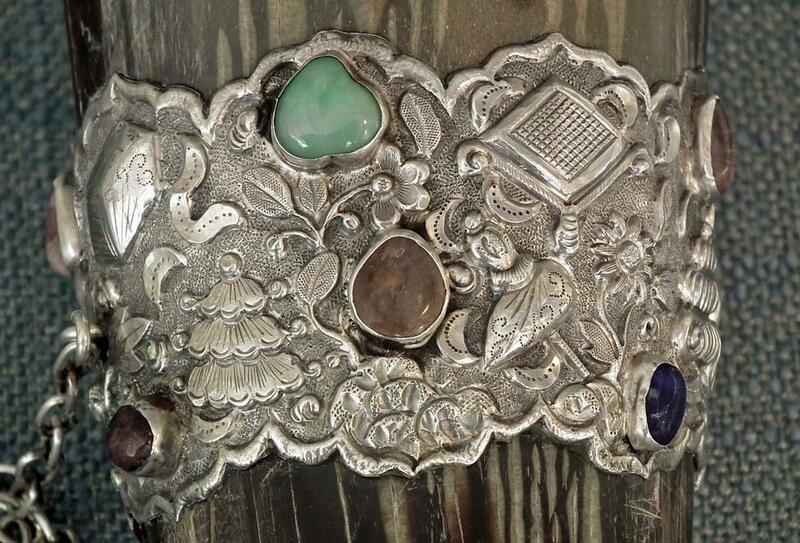 CONDITION: Shows signs of usage and wear. The surface of the horn has some natural flaws in the horn due to drying out and shrinking as is common with this natural material since it is a very old horn and of very old wood. The end of the bottom mounting has a minor crack.